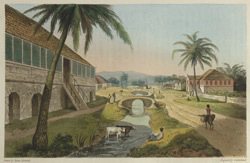 Print of the Holland Estate from James Hakewill's 'A Picturesque Tour in the island of Jamaica.' The Holland Estate was a sugar plantation in St Thomas, owned at this time (1820) by George Watson Taylor. The view is of the plantation works, and the large brick building on the left is the barracks - the lodging house for white employees such as the bookkeepers. Behind this can be seen the boiling house and the still house. The pink building to the right is the Overseer's house and behind this can be seen a mill with a covered courtyard for the animals.